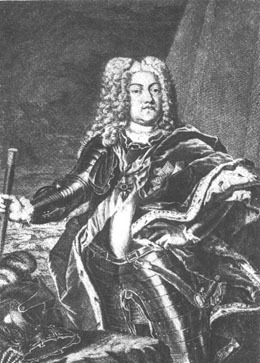 Augustus II, King of Poland, and, as Frederick Augustus I, Elector of Saxony, second son of John George III, elector of Saxony, was born at Dresden on the 12th of May 1670. He was well educated, spent some years in travel and in fighting against France, and on account of his immense strength was known as "the Strong." On the death of his brother, John George IV, in 1694, he became Elector of Saxony, and in 1695 and 1696 led the imperial troops against the Turks, but without very much success. When John Sobieski died in 1696, Augustus was a candidate for the Polish throne, and in order to further his chances became a Roman Catholic, a step which was strongly resented in Saxony. By a lavish expenditure of money, and by his promptness in entering the country, he secured his election and coronation in September 1697, and his principal rival F. L. de Bourbon, prince of Conti, abandoned the contest and returned to France. Augustus continued the war against the Turks for a time, and being anxious to extend his influence and to find a pretext for retaining the Saxon troops in Poland, made an alliance in 1699 with Russia and Denmark against Charles XII of Sweden. The Poles would not assist, and at the head of the Saxons Augustus invaded Livonia, but for various causes the campaign was not a success, and in July 1702 he was defeated by Charles at Klissow. Augustus was then deposed in Poland, and after holding Warsaw for a short time he fled to Saxony. The alliance with Russia was renewed and in reply Charles invaded Saxony in 1706, and compelled the elector to sign the treaty of Altranstadt in September of that year, to recognize Stanislaus Leszczynski as his successor in Poland, and to abandon the Russian alliance. During the War of the Spanish Succession, Augustus fought with the imperialists in the Netherlands, but after the defeat of Charles XII at Poltawa in July 1709, he turned his attention to the recovery of Poland. Declaring the treaty of Altranstadt void and renewing his alliance with Russia and Denmark, he quickly recovered the Polish crown. He then attacked Swedish Pomerania. He was handicapped by the mutual jealousy of the Saxons and the Poles, and a struggle broke out in Poland which was only ended when the king promised to limit the number of his army in that country to 18,000 men. Peace was made with Sweden in December 1719 at Stockholm after the death of Charles XII, and Augustus was recognized as king of Poland. His remaining years were spent in futile plans to make Poland a hereditary monarchy, to weaken the power of the Saxon nobles, and to gain territory for his sons in various parts of Europe. He was a man of extravagant and luxurious tastes, and, although he greatly improved the city of Dresden, he cannot be called a good ruler. He sought to govern Saxony in an absolute fashion, and, in spite of his declaration that his conversion to Roman Catholicism was personal only, assisted the spread of the teachings of Rome. His wife was Christine Eberhardine, a member of the Hohenzollern family, who left him when he became a Roman Catholic, and died in 1727. Augustus died at Warsaw on the 1st of February 1733, leaving a son Frederick Augustus, who succeeded him in Poland and Saxony, and many illegitimate children, among whom was the famous general, Maurice of Saxony, known as Marshal Saxe.